Posted on 03/20/2019 by Parklifer	in Live Review and tagged 9:30 Club, California, Ella Vos, free tickets, Los Angeles, synthpop, ticket giveaway. Pop star Ella Vos released Watch and Wait, a new EP, in January, and that record was inspired by her struggle with lymphoma and her recovery. 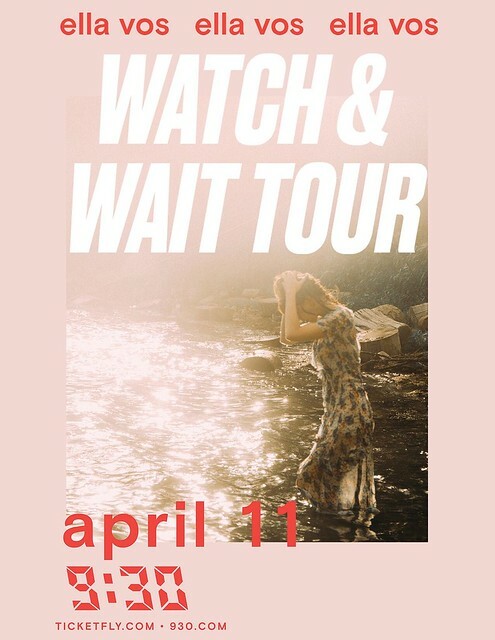 She performs at 9:30 Club on Thursday, April 11, and you can win tickets to catch the inspirational show with Parklife DC. Parklife DC is giving away a pair of tickets to see Ella Vos at 9:30 Club. To win, simply leave a comment on this blog. You can leave any comment, but we would like to know your favorite song by Ella Vos. Comments will be closed at 5pm on Friday, and a winner will be randomly selected. The winner will be notified by email. The winner must respond to our email within 24 hours, or they will forfeit their tickets and we will pick another winner. We will email you instructions on claiming your ticket. Good luck! If you don’t win, buy your tickets online. I wanna go see Ella Vos perform Empty Hands!